THIS IS A SUGAR FREE SWEET. Very easy to make and healthy ladoo. Seedless dates - 25 no. Chop the dates and microwave high for 1 minute OR saute in a kadai until soft. 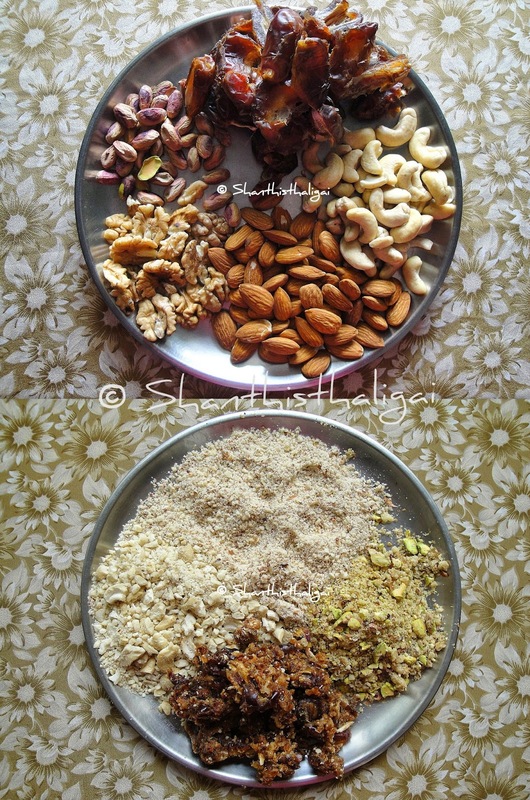 Dry roast the nuts separately one by one. Blend them one by one separately to a coarse powder. Give a quick blend to the dates also. Combine all, alongwith cardamom powder and mix well with your hand. Add melted butter, honey, mix well and microwave again for 1 minute. Mix well again. Shape to balls / ladoos. Healthy n delicious ladoos..would love to have it now! Delicious and lovely looking dry fruits ladoos. Wonderfully prepared. Oh thats really nice laddu with honey and dates.